Telltale teeth: Tony, who has an ADNP mutation, had 16 teeth when he was 13 months old. It was clear from birth that Tony Sermone was not well: He had heart problems and developmental delay, and would later be diagnosed with autism. Tony had all the earmarks of a genetic syndrome, but doctors could not figure out which one. One by one, the tests looked for genetic mutations, some more than once — and one by one, the tests came back negative. Frustrated, Sandra Bedrosian-Sermone, Tony’s mother, took him to Duke University in Durham, North Carolina, nearly 3,000 miles from their home in Washington. Researchers there sequenced all of Tony’s genes, looking for mutations he had not inherited from his parents. They found a mutation in ADNP, one of the top candidate genes for autism. It took six years for Bedrosian-Sermone to find this answer. But her odyssey might make it easier for other parents whose children have the mutation. Through her own sleuthing, she found that the vast majority of children with an ADNP mutation grow a nearly full set of baby teeth, including molars, before their first birthday. (Children typically reach this milestone between age 2 and 3.) She teamed up with researchers in Belgium and Israel to show that this feature is likely to be a direct result of mutations in ADNP1. ADNP mutations are exceedingly rare. But a 1-year-old who has developmental delay and a mouth full of molars has a good chance of carrying the mutation, says the study’s lead researcher Illana Gozes, professor of clinical biochemistry at Tel Aviv University in Israel. For her role in collecting this information, Bedrosian-Sermone is listed as a researcher on the study, published 21 February in Translational Psychiatry. “This speaks to the power of parents driving interesting research observations,” says Raphael Bernier, associate professor of psychiatry and behavioral science at the University of Washington in Seattle, who was not involved in the study. Once she learned that Tony, now 9, had a specific mutation, Bedrosian-Sermone gathered all the research she could find on ADNP. She created a Facebook page for people affected by the mutation. And last year, she launched the ADNP Kids Research Foundation, an organization dedicated to supporting families and researching ADNP mutations. 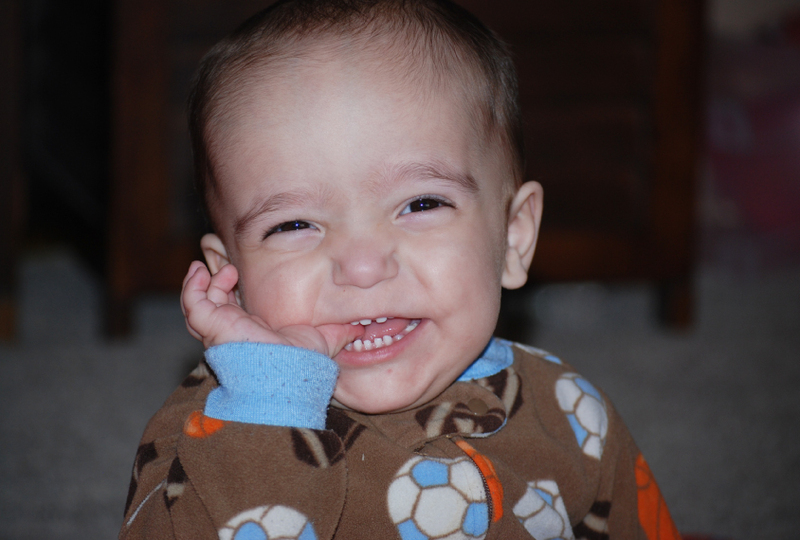 Through the foundation’s Facebook page, she discovered that other children with ADNP mutations share her son’s striking features — particularly, precocious baby teeth. At 11 months of age, Tony had nearly all his baby teeth, earning him the nickname ‘Little Shark.’ Ironically, Tony showed little interest in food and lacked the motors skills to chew. His fraternal twin Rocco, by contrast, fervently gummed his food. Bedrosian-Sermone asked every parent she met about early teeth; most had noticed it in their own children with ADNP mutations. “I just became obsessed with teeth for a solid year,” she says. The new study includes data from 54 children with ADNP mutations, all identified by Bedrosian-Sermone; 81 percent of the children grow their baby teeth prematurely. Bedrosian-Sermone now has data from 105 children with ADNP mutations. Bedrosian-Sermone sent her data to every ADNP researcher she could find, including Gozes. As she added more and more families to her database, Gozes and her team took notice. They turned to mice missing one copy of ADNP. The mice show atypical tooth development, the researchers found. But instead of developing teeth early like children with ADNP mutations, the mice grow their teeth late. This may be because mice do not develop baby teeth, Gozes says. ADNP is known to regulate the expression of other genes. The researchers found 50 genes that show altered expression levels in the skin cells of three children with ADNP mutations and are involved in bone formation. This pathway is connected to tooth development, Gozes says. One of these genes, called AKAP6, is expressed at lower levels in children with ADNP mutations and in brain tissue from ADNP mice. The study is notable in that it confirms parental observations in an animal model, and tries to connect how ADNP mutations may result in precocious teeth, says Bernier. “It’s sort of living my dream in terms of how I think it should be done,” he says. ADNP is not the only autism-linked gene tied to atypical tooth development. In a 2015 study, Bernier and his colleagues found that mutations in DYRK1A lead to an atypically small head size, causing teeth to crowd. In the meantime, Bedrosian-Sermone is continuing her quest to characterize children with ADNP mutations. She says, for example, that the children tend to be friendly and social with adults but ignore their peers: Tony paid no attention to Rocco.